When I first began my minimalist journey, one of the first places I began ‘decluttering’ in my life was my diet. It wasn’t until I moved away to university and was able to take full control of what I bought and ate that I really got things started. I’ve always been interested in food, cooking, and nutrition and since I’ve studied Food technology for just over five years, it’s been a big part of my life for a long time. 1. Eat simply. Despite my dedication to food, when it comes to actual cooking, sometimes there’s not enough time or I just get a little bit lazy. This doesn’t mean I should pick up the phone and call in a takeaway straight away, instead, I’ll just throw together some simple fresh ingredients and make a meal out of that. I think one of the advantages I have is that I am not in the least bit fussy about what I eat, and I am perfectly happy eating the same thing three nights in a row. 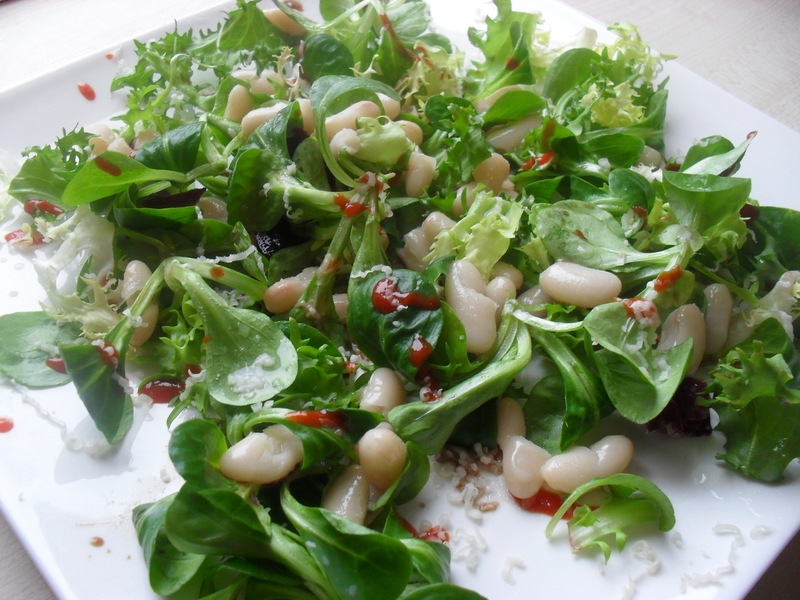 For example, if I don’t feel like cooking, I’ll just make a salad out of some spinach and rocket, and flavour it with a spicy dressing and some butter beans. Total time 2 minutes. 2. Cook simply. On the same note, I don’t enjoy excessive cooking as I can be a little bit impatient sometimes. I prefer to only eat things that can be cooked either in less than 10 minutes or by steaming or boiling (or microwaving). This is one of the reasons why I became pescetarian as meat took too long to cook (except when making burger patties). It’s not all to do with laziness however, because by cooking simply and quickly you preserve more of the goodness in the food as heat destroys a lot of the vitamins and washes out the minerals in it. 3. Drink simply. I almost never drink fizzy drinks, mostly because I don’t feel they quench my thirst! Also, they are completely full of empty calories and processed stuff, I just don’t feel comfortable fuelling my body with dirty oil so to speak. However, I do have the occasional alcoholic drink every now and again (I am a student after all) but only occasionally. Normally, I drink water, but I also have a collection of teas that I like to make everyday, including green tea, jasmine tea, orange tea, pomegranate tea, white tea, lotus leaf tea(! ), and camomile tea for night time. Tea has almost no calories, is refreshing and is full of anti-oxidants. 4. Eating less. About three times a week, I try intermittent fasting. I found out about it through my research about diets about a year ago. I read some of the studies and to me, the results sound credible. Now, I don’t intend to give anyone dietary advice here, this is post is about what I feel works for me. Intermittent fasting, in short, is going through short periods of not eating. At first, I was skeptical, but then I realised that by doing so, one can reduce the amount of calories they eat in a day, and basically it’s another way of saying eat less. You can find out more about it through this great ebook. 5. Simplify the kitchen. The kitchen is one of the places where mess and clutter can build up quickly if you’re not careful. I share a kitchen with my flatmates, so there is limited space which fits me all the better. I don’t buy equipment I don’t need, I have just enough plates and cups that I use all of them and I only buy ingredients I know I will use before the expiry date. The last point is really important because that where a bunch of money can be saved. I don’t write it out or anything, but I tend to have a plan in my head about what I will eat during the following week and I shop accordingly so I use up everything before it goes off. This entry was posted in Health, Minimalism on April 25 2010 by Jessica. 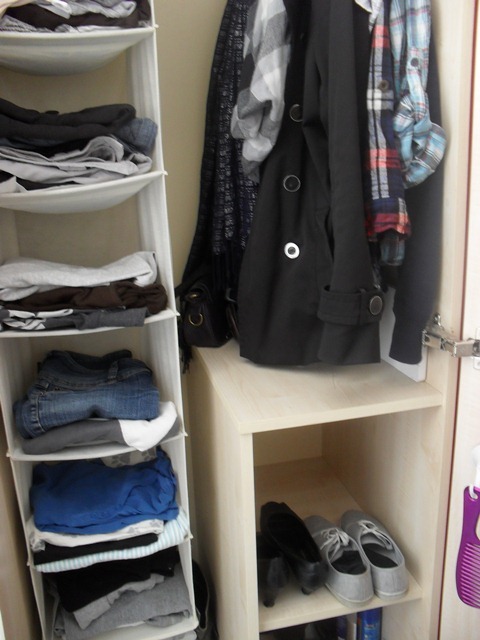 I’ve seen wardrobes that are practically spilling with clothes. Actually, in some, you can even see corners of clothes hang out forlornly over the shelf edge, constantly being squashed because it’s stopping the door from fulling closing. As for shoes, I’m lucky enough to live in a country with fairly mild weather, so I can get away with wearing fairly light shoes that don’t need replacing that often if I take care of them. I love wearing my brown boots, but they’re impractical for cycling so I usually go for the casual plimpsole/trainer. I own a pair of plain black heels that go with literally any outfit and have served me well for almost two years now for going out at night (both pictured above). All of my socks and underwear are plain and mostly black. All of my clothes are easy to wash or can be hand-washed, and tumble dried and don’t need ironing. They also dry very quickly, which is good because it means I can ‘turn over’ clothes efficiently, ie. I don’t have to wait for long for clothes to dry on a rack before being able to wear them again. I can usually wash something in the sink and hang it up overnight and wear it in the morning. Here is another top I love, as you can see, not everything has to be just one plain colour if you dress it up! Here it is pictured with the above jeans and black skirt and a pair of shorts. These three outfits are perfect for casualwear, eveningwear and summerwear! Think about the rest of your wardrobe and how many pieces you can match it with. Try not to buy anything that has ‘occasion restrictions’ such as ‘really-hot-days-only’ or ‘posh-occasion-only’. And finally, if you buy this new piece of clothing, what can you throw out/donate in it’s place? This entry was posted in Minimalism, Money on April 18 2010 by Jessica. You would think that there would be little to say on the subject of minimalism, but ironically this isn’t the case. Minimalism isn’t simply about throwing out everything you own, or about boycotting purchasing new things altogether. Getting to the stage where you only have what you need is a difficult battle, but it doesn’t end there. You have to be constantly aware of accumulating more stuff and the consequences and futility of perpetually pursuing material posessions. On top of that, depending on people’s preferences and situations, there isn’t a cookie cutter criteria for a minimalist. I’ve always believed that minimalism can’t be measured, you can’t take a number like ‘100 things’ and apply it to everybody. Compromises have to be made for preferences, jobs, children and other lifestyles. So, minimalism isn’t simple, but who cares? Arduous journeys lead to great goals, that’s what makes them so great. I don’t want to put anyone off, but I know it takes a certain level of commitment to begin and maintain a minimalist lifestyle. The secret is to make baby steps, and work out what works for you. 1. Versatility. If something can be used for two functions instead of one, you have automatically halved the number of things you would have needed and perhaps saved some money in the process. Versatile clothing is the key to a minimalist wardrobe. 2. Durability. The longer it lasts, the less you spend fixing it or replacing it. Durability is what dispels the myth that all minimalists are frugalists. Sometimes, it’s worth paying that extra amount for better quality so that you don’t have to constantly replace it. But be careful, durability should not be mixed up with perceived quality achieved through marketing and brand names. 3. Availability. It’s better to avoid relying on things that are too rare or extravagant that would be expensive and/or difficult to replace, since you could become stuck if it gets lost, broken or stolen. The point of minimalism is that you don’t have to constantly worry about your material things. 4. Portability. For people that travel a lot, the portability of an item is extremely valuable. Ideally, most items should be easy to pack, light and have multiple functions so that you can take a smaller and more manageable suitcase. Walking the life of minimalism isn’t done without making sacrifices and difficult choices but every right decision, no matter how small, contributes somehow as one small step forwards, instead of backwards, towards happiness. And you never know, the impact you make may inspire others and can create a revolution. This entry was posted in Minimalism on April 9 2010 by Jessica. If you’re reading this first thing in the morning, I suggest you save it for later, because a massive dollop of mobidity is about to come you way. I hope you forgive me! Today, I’ll be making my way via a long car journey to visit my extended family because a few days ago, my uncle suddenly passed away. My family literally came from nothing. I think they practically invented the phrase “with just the clothes on their backs”. All their lives they have worked in order to aquire material possessions because that was the only way they knew how to get a better life. My Dad spent years trading hours for minimum wage at a clothing factory until it got shut down. Without a job left to feed his family, he used his savings to take a risk and it paid off. Now my Dad is an entrepreneur who doesn’t have to swap his time away for cash. Because of their background, it’s very difficult for my family to understand minimalism. I choose minimalism because I want to be able to afford experiences, like being able to see the world instead of being stationary and building a houseful of junk. Sometimes, I talk about the pursuit of minimalism as if it is the same as the pursuit of happiness. I have believed this to be true for a long time, but is it true for everyone? What difference does it make if you die happy vs if you die alone, aren’t you still dead? The only answer that I can come up with is that death can’t be helped, but how you get there is up to you. At times, life may seem futile, but if you can’t control how and when you are going to die, you might as well control how you are going to live. My uncle has reminded me that life is so so fragile, and death can be really unexpected. Being relatively young has little to do with when death will come a-knockin’. It’s like betting on red on roulette when it’s been black five times in a row. The ball doesn’t care which colour it’s been on before, just like it doesn’t make a difference to Death if you’re young, old, healthy, wealthy or wise. I think what I’m trying to say is that my uncle, my Dad and the rest of my family have worked all their lives for more and more money, and yet of course, they’re not immune to death. But in doing so, I think to some extent they’ve sacrificed a little bit of happiness along the way. My uncle will be leaving behind a business, a house, a car, his wardrobe, a shed full of tools, as well as his family. Now all of the stuff he left behind will be a massive burden on his family, since they don’t want to get rid of it, but it hurts too much to keep. But of course, you don’t really know until you get there. My uncle could have felt very proud during his last moments to have left behind a house and enough money for his wife and kids. I don’t think he would have believed minimalism would make him happy, and in this case, I sure hope he didn’t. This entry was posted in Minimalism, Relationships on April 4 2010 by Jessica.